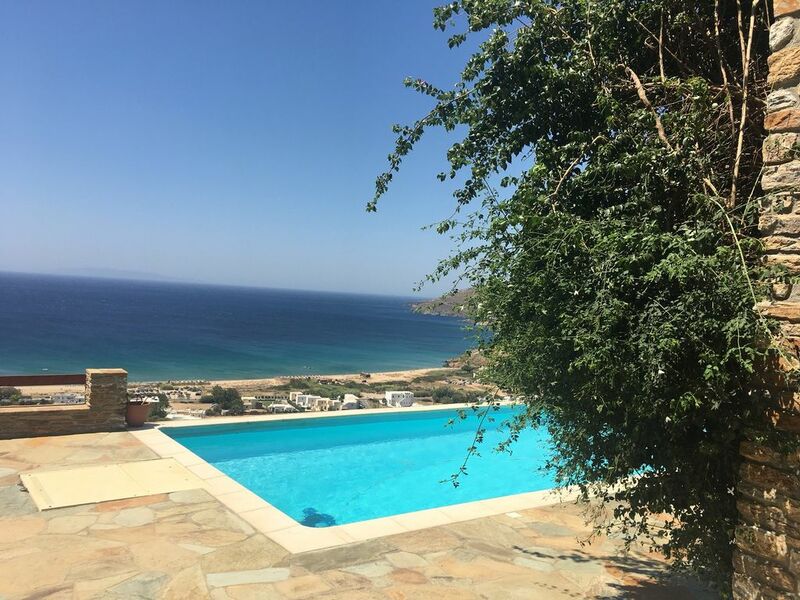 Luxurious villa with a swimming pool and amphitheatric southern sea view towards the islands of Kea, Kythnos and Gyaros, situated on a land of one acre. The villa was designed by architect Mari Goga (www.marigoga.com), with the scope of best incorporating it in the land, through comfortable & open spaces both inside the home and out. It's worthy to note that the stone parts of the home were built by using the stone that was excavated from the land where it stands. The villa is built on two levels. At the ground floor of around 100 sq. m. there is a very spacious dining and living room area with fireplace and original vintage furniture . The kitchen is fully furnished with all necessary amenities. On the upper level there are three bedrooms, all with en suite bathrooms, balconies and spectacular southern sea views. Each bedroom sleeps two. There are outdoors covered dining and lounge areas overlooking the pool, the spectacular beach and the sea scenery. The villa overlooks St Peter's beach, one of the most beautiful,of the many that Andros has to offer. It is located at just a few kilometres from the port of Gavrion and the vibrant village of Batsi. One can find tavernas and a supermarket at less than one kilometre distance, by the shore. The distance to St peters beech is approx 600 meters, of which 200 meters have incline. The villa is built with the personal care of the owners. All the furniture is custom built or from the private estate of the owners. All dining and living room furniture are genuine antiques from the 30s and 40s. The rent of another villa nearby with equal specifications is available through this site. Apart from the more than 40 magnificent swim beaches, water sport centres, culture, ancient, byzantine and modern , culinary delights and spectacular mountains, Andros island is amongst the best of Europe for hiking with 160 km in total way marked routes, 100km certified hiking routes, 15 days of guaranteed hiking quality (info@androsroutes.gr). We have been involved for over thirty years in an international career and we are experienced travellers ourselves, who understand very well the aspirations and possible frustrations during vacationing and living outside of ones home. We currently live in London, and we have two young adults , with whom we have been spending all our summer vacations for the last 30 years in Andros. We have been spending our summer vacations over the last 30 years in Andros, and over the last 25 years we have owned our own property. We want that holidaymakers experience the magnificence and diversity of this island combined with a hospitality of high aesthetic quality and with our personal care. Stunning sea views, ideal location, brand new villa close to the best beaches and all necessary amenities .Close to beautiful village of Batsi and the scenic port of Gavrio. All bedrooms have en suite bathrooms. Extra full bathroom at ground floor. Eco shower by the pool. In case needed (practically never between April and November) central heating is available. Airco units have warm air capability. Functioning fireplace in the main living area. Indoor as well as outdoor. Outside dining seats 8 and can seat up to 12. Lots of DVDs upon request. We spent 10 days in Maria's wonderful villa which is very spacious, confortable and has beautiful views… We had an absolutely fantastic time discovering Andros, which surprisingly is not overwhelmingly touristic and is amazingly beautiful ! We would set off after breakfast and drive across the mountains (4 wheel drive is necessary !) and breathtaking views to reach secluded beaches which were clean, with pristine water. Sometime we stayed home and enjoyed relaxing and reading around the pool… I can't say much about the restaurants because we loved the villa so much that we preferred to eat at home. Maria told us where to buy excellent meat and fish… On the negative, the internet connexion was very poor and a problem for the teen-agers, and sometime the water pressure in the shower was not very good. But this did not spoil our vacation ! So it's 5 stars for the villa and Andros. Thank you very much for your enthusiastic comments about villa Aggelikes and our wonderful Andros island. We hope to see you again soon. This year for some reason unknown to us and despite our efforts the internet speed was indeed low. In order to adress this issue we have been in contact with a satellite internet provider and for the next year we are going to be better! Also, this is a price you pay to have a house in such an amazing location, outside of the perifery of the town but still so close to everything, with a lot of privacy! We hope to see you again, because you were wonderful guests! The house is beautiful and well maintained, the kitchen is very well equipped and we were able to prepare really good dishes to enjoy on the terrace while the rooms and bathrooms are spacious and well furnished. We enjoyed the swimming pool and the beautiful view but also the blossoming of the gorgeous jasmine in August. Maria is welcoming and helpful and provides a good customer service, the location on the island allows you to reach beautiful beaches without crowds or travel the countless hiking trails.Our holiday was very pleasant and the island is beautiful! This is one of the most beautiful villas and locations we have stayed in. The villa is perched half way up a mountain overlooking St Peter's Beach and Gavrio. The views are truly breathtaking with the islands of Megalo in the immediate foreground and Kea and Giaros in the distance and ferries drifting into and out of the port. Sunsets were magical. The villa itself has a fabulous infinity pool, with outdoor sun loungers, and outdoor table for dining and drinking in the views. The kitchen was well equipped and all the rooms tastefully decorated with air conditioning. The villas is in a super convenient location with the beach, four beach bars and a supermarket literally 2-3 minutes drive down the mountain, with the port at Gavrio 5 minutes drive away. There are dozens of restaurants in Gavrio and Batsi but also well worth the drive to Andros Hora. There are numerous hiking trails on Andros and No.15 is well worth doing from the villa up the valley past the 4th C BC Agios Petros tower and the beautiful sleepy village. Don't miss the drive over the mountains to Vitali beach. Andros is verdant compared to some of the other Cycladic islands with forests and springs and the scenery is beautiful. We loved our stay here. Thanks to Maria and Konstantinos for being wonderful hosts. Our first time on Andros….We booked this house for our group of friends and family to celebrate a birthday and have a 2 week vacation. The pictures do not really do the house justice…we arrived and were all so excited to see that everything was so beautifully done from the decor in the house to the bedrooms all facing amazing Ocean views…waking up there every day was truly a most wonderful experience! The pool was just perfect…The landscaping lush and full of color. The location of the house is perfectly situated between Batsi and Gavrio - we were wherever we needed to be within a few minutes drive. Lastly our hosts Maria and Kostas went above and beyond to make our stay more than perfect. If you are looking for the perfect Oasis in the Greek Isles - this will not disappoint. We had a truly wonderful vacation in Andros - We will definitely by staying here again next year. C'était notre première fois en Grèce et nous avons passé un superbe séjour de 15 jours ! Pas de foule, météo sublime et des paysages à couper le souffle. Pour ce qui est de la villa, tout le confort nécessaire est présent, piscine au top, espaces de vie très agréables et vue panoramique. Plusieurs plages magnifique accessibles à pied, petits commerces et restaurants à proximité immédiate et des grecs adorables. Bravo encore à Maria pour son accueil et la qualité des prestations offertes. Andros est une île préservée du tourisme de masse contrairement à ses voisines, et c'est ça qui est le plus bluffant...difficile de partir ailleurs après avoir vécu ça ! Wir können uns den positiven Bewertungen unserer Vormieter nur anschließen. Wir haben einen sehr schönen Familienurlaub in diesem wundervollen, großzügigen Haus verbracht. Die Einrichtung und Ausstattung waren noch besser als wir von den Bildern erwartet hätten. Aus nahezu allen Fenstern hat man einen überwältigenden Meerblick. Haus und Garten sind super gepflegt und sehr hochwertig eingerichtet. Wir haben uns wirklich sofort zuhause gefühlt. Der Kontakt mit der Vermieterin war unkompliziert und angenehm, auftretende Fragen konnten schnell und immer zu unserer Zufriedenheit geklärt werden. Wir können einen Aufenthalt hier wärmsten empfehlen! Andros is one of the most beautiful and diverse cycladic islands. Apart from exquisite beaches, more than thirty, this is an island of culture and of the arts. The Goulandris Museum (http://www.moca-andros.gr/en/) at the chora of andros is a world class museum, each year host of high caliber artists , the Archaelogical Museum (http://odysseus.culture.gr/h/1/eh151.jsp?obj_id=3282) and the Museum of Paleopolis exhibit the past of ancient andros, kydonieos museum specializes in modern greek painters. Culinary pleasures are also abudent with formal restaurants, gastro tavernas and simple , but indeed gourmet, beach tavernas. For our guests that want to dine at the villas without having to cook the near by well known Yannoulis taverna (+30 228 207 1385) will be more than happy to cater. With regard to medi care there is a medical center at Gavrio, 3 km from the villas , and a most experienced doctor who serves that area of the island. A dentist is also available. There are a lot of very scenic villages inland, some of them with great sea views . Being traditionally an agricultural, fisheries and shipowners community, Andros has escaped from massive tourism and appeals to the more sophisticated visitor. We as your hosts and lovers of the island for more than three decades ( and experienced world travellers) will be eager and proud to offer you information and tips so as to make your first stay at Andros, be that the case, the start of an enduring love relationship for the senses the mind.